My human rights organization, the American Freedom Defense Initiative, or AFDI, recently scored another major victory for the freedom of speech in Philadelphia, "the cradle of liberty." A court ruled that our ads highlighting Islamic Jew-hatred and the Nazi-Islamic alliance, which had been previously denied, could not be prohibited. The judge ruled they had to run. They went up last Wednesday, and they're causing the predictable firestorm among the enemedia, Islamic supremacists and their useful idiots on the left. Philadelphia's Nutter of a mayor, Michael Nutter, and the usual suspects are galvanized and united and so forth. Nutter denounced our ads, saying, "We will not allow any misguided and opportunistic political tactics to undermine or obscure the shared respect among communities of faith, nor will we permit it to distract or disrupt our city as we prepare for a week in which we observe great religious traditions of Easter, Passover and other traditions that anyone else may enjoy." CBS News reported that SEPTA, the Philadelphia-area transit authority, "tried to stop the ads, but a federal judge ruled the ads can resume. SEPTA is urging anyone who may find the ads to be offensive to avoid defacing them, saying this is simply just the law." SEPTA issued a statement saying, "SEPTA regrets any discomfort that may be caused from viewing these controversial messages during the weeks they will be displayed." Yet the comments on this CBS piece are staunchly with us, despite the media and political elites' submission. If only Islamic Jew-hatred, jihad and Shariah elicited this kind of response from the political and media elites – if they did, we wouldn't be in the trouble we're in now. Instead, we get articles like one that Metro ran with the headline, "Muslims 'hurt' by new SEPTA ads." That's what passes for journalism these days. Muslims should be hurt by the chaos their devout are causing in Kenya, Mali, Nigeria, Congo, the Central African Republic, Iraq, Syria, Israel, Egypt, Jordan, et al. Muslims should be "hurt" by the creed apartheid, gender apartheid, Islamic Jew-hatred, misogyny, etc. enshrined in Islamic texts and teachings. Devout Muslims stormed a university campus in Kenya last week and slaughtered 148 Christians while releasing the Muslims. Do these Muslims feel "hurt" by that? Metro quotes several Muslims expressing their "hurt" over our ads of truth, including a Muslim woman, Amira Muhammed, saying this of our ad's statement that Islamic Jew-hatred is in the Quran: "That's wrong. That's not in the Quran. It says we have to respect other religions." Actually it is in the Quran, Ms. Muhammed. The Quran says the Jews of all people will have the most hostility to Muslims (5:82); it says they are accursed of Allah (9:30), and that Allah transformed Sabbath-breaking Jews into apes and pigs (2:63-65; 5:59-60; 7:166). And there is much, much more of this. 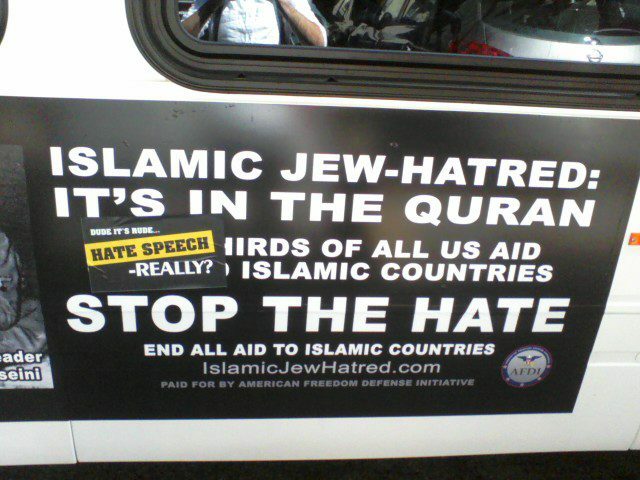 No one can honestly claim that Islamic Jew-hatred is not in the Quran, and so they make false statements about our ads to make them seem inflammatory – i.e., that they are akin to Nazi propaganda. Meanwhile, Islamic anti-Semitism is growing worldwide and is not being addressed. If these Muslims find my ad so offensive, do they find Islamic anti-Semitism offensive? Instead of attacking me, they should be working for genuine and sincere reform of Islam and a decisive Muslim repudiation of anti-Semitism. And inevitably, some of the ads were defaced, and Muslim supremacists and their goose-stepping left-wing lapdogs are crowing about it. These fools don't realize that SEPTA has to make good on this destruction. But what these goons also don't realize is that they add to our message: They plastered our ads with stickers reading, "Hate speech." Yes, the Islamic Jew-hatred, creed apartheid, gender apartheid, genocide exhortations and misogyny found in abundance in the Quran (and Islamic texts and teachings) are hate speech. I have two words for these hate preachers: "Thank you." The role of the Islamic world during World War II. Most people are painfully unaware of the Mufti al Husseini. Islamic Jew-hatred, the Quranic texts and teachings that give rise to Islamic anti-Semitism the world over. How two-thirds of all U.S. aid goes to Islamic countries.